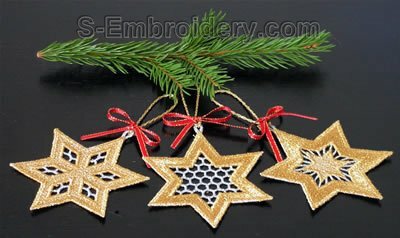 A set of 3 Christmas tree star ornaments in free standing lace technique. 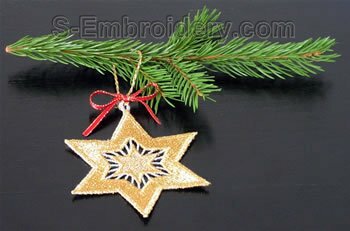 Each of the 3 stars is available in 2 versions - one of them with a hoop for hanging on a Christmas tree. There is a small difference in design size and stitch count between the different versions. 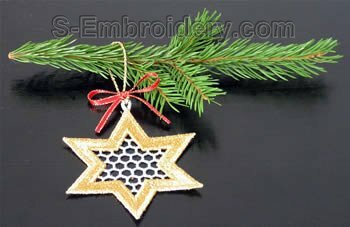 These Christmas FS lace ornaments will fit in 4 x 4 hoops. The design without a hanging hoop measures 3.63 x 3.15 inches (92.1 x 79.9) and has 13,074 stitches. The design without a hanging hoop measures 3.63 x 3.14 inches (92.1 x 79.7) and has 12,451 stitches. The design without a hanging hoop measures 3.63 x 3.15 inches (91.9 x 79.9) and has 13,577 stitches. 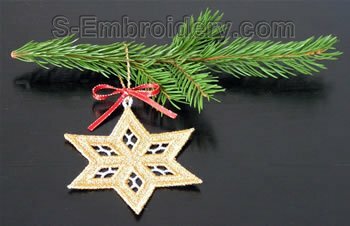 The sample designs shown on the images below were stitched out using 2 colors of Madeira FS metalized embroidery thread. 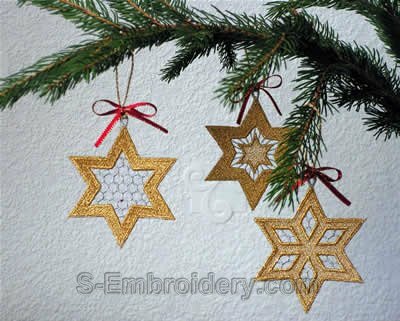 Note: The Star # 1 and #2 designs are modified versions of the star decorations in SKU 10188. The new stars have modified fill stitches and are designed in 2 colors.